Preheat the oven to 200 degrees. Put potatoes on a baking sheet – in the oven. Depending on the size of the potatoes, roast ± 45 minutes to 60 minutes and until soft. Keep the sweet potatoes in the oven – for 20 more minutes – while it’s off. Cook the quinoa as directed on the package. Meanwhile, cut the cucumber and peppers into small cubes, spring onion into thin slices and cilantro coarsely. Drain the quinoa; mix with a tablespoon of olive oil and season with salt. Roast the nuts and seeds (without oil) in a frying pan until they begin to color. Mix all ingredients for the dressing. 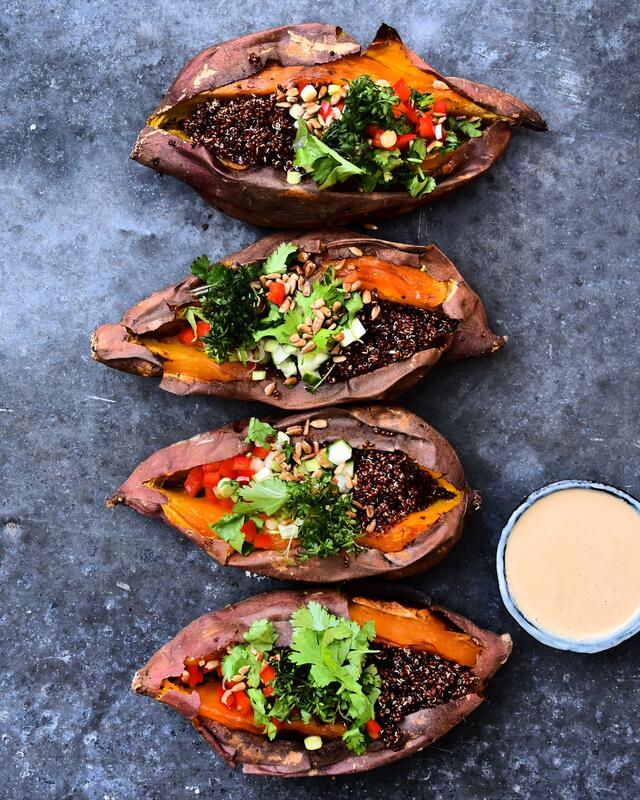 Make an incision in the sweet potatoes and fill them with quinoa, cucumber, pepper, coriander, nuts and seeds and some cress. Serve the sauce on the side. You can also add feta or whipped feta sauce!